Cultivated by small farmholders in a tropical region intersected by countless rivers with dramatic waterfalls near the junction of Vietnam, Cambodia, and Thailand. Rich, almost textured on the palate, this coffee is especially big bodied. Very sweet, with soft intermingling flavors of chocolate and vanilla. Overall/Notes: Sweet and massively big bodied. Read more on their profile page. 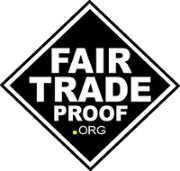 Track your coffee to the origin on our Fair Trade Proof dot Org website. From our new partners in Laos - rich, almost textured on the palate, and especially big bodied. Very sweet, with soft intermingling flavors of chocolate and vanilla. Clean, bold coffee that tastes great from my Kalita Wave or French Press. Sweet and very satisfying to drink. Wanted to try something different from my normal light roast and this was great! Very glad I tried it, will be ordering more. I normally prefer a dark roast. Jump Start is my preferred first cup of the day. That said, I ordered this to try a coffee from Laos. This one surprised me! It's very smooth. I like the tones of chocolate and vanilla. It makes a great second cup for me after I've had my favorite dark roast. I'm thinking it might make a good iced coffee. If you're curious, give it a try!